Okay, so here’s the story. Back in my pub night filled misspent youth I used to like ordering this drink which was a mix of hard cider and stout (usually Guinness). It’s known as a Black Velvet, or sometimes it’s called a Snakebite. Last night I was making stew for dinner. I often add beer to our stew. This time, thinking back to the taste of that Black Velvet drink, I thought… Hey why not add stout AND cider? Luckily I still had a few Green Mountain Hot Apple Cider Mix K-cups on hand, so I was able to use my Keurig to brew up a hot cider lickety-split. As the stew simmered away I taste tested the broth and thought it was the perfect mix of beef and stout with a bit of sweetness from the cider. The meat turned out very tender, not the least bit chewy. And the broth was just the Snakebite-flavour I was craving. The big test though was to see how my “Black Velvet Stew” went over with hubby and the kids. I was happy to find it got passing grades all around. About 3 large potatoes, peeled and cut into bite sized chunks. In a medium or large skillet heat up the olive oil over medium-high heat. Added the cubed beef and brown it on all sides (a few minutes per side). Leaving the oil in the skillet, move the beef into a large pot (one that has a lid). Turn skillet down to medium, or medium-low. Add diced onions to skillet, cook for about five minutes, stirring frequently. Add garlic and cook until soft, about 1 minute. Add one beer, mins a few swigs, to the skillet. Stir well. Be sure to scrape up any browned bits along the bottom of the pan. Pour the beer, onions and garlic into the stew pot. Add carrots to the pot. Brew two 8 ounce ciders using the Green Mountain Hot Apple Cider k-cups and add those to the pot. Add enough beef broth that everything is covered in liquid (for me this was a bit less than two cups). Put the pot on the stove and bring it to a simmer. Give it a good stir. Reduce heat to low. Put a lid on it and cook for one hour. Dissolve 4 tbsp cornstarch in 4 tbsp cold water. Add this to the stew and stir, stir, stir. stir. Add potatoes to the pot. Put the lid back on and leave it cooking on low for another half hour. Take the lid off and let it cook for about thirty minutes more. And, voila. Stew is served. I suggest serving it with pints of stout for the grown-ups, and warm glasses of hot apple cider for the kids. Disclosure: Keurig sent me some Green Mountain Hot Apple Cider Mix to sample, and I ended up using it in this recipe. As always my words and opinions are my own. This looks amazing! 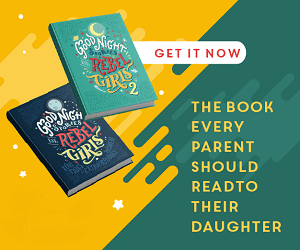 I have to tell you that it was your title of this post that caught my attention! I’m going to have to try this recipe! Ha. Thanks Christine. I was hoping that title might catch someone’s eye. 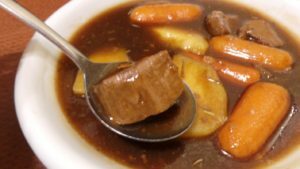 I love beef stew and this recipe sounds and looks sooo yummy. I’m surprised that the total cooking time, once everything is in the pot, is only 2 hours. I always thought stewing beef had to cook for many hours to become tender. So glad your family enjoyed it.. I love making stews, so good especially in the winter and I use alcohol when I make my stews but I have to keep that my secret or no one would eat it, what gets me is they love it but as soon as I say I used beer or wine it’s omg it’s so gross, kids!! My kids get weird about beer in the stew too. I tried to explain the whole alcohol evaporates at high temperatures thing to them, but it didn’t fly. So basically this falls under, what happens when they are not in the room they do not need to know. LOL. Wow! 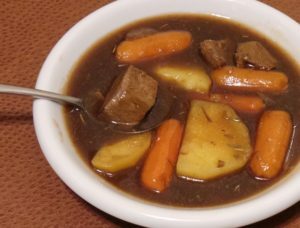 I love stew and this one really has a new twist on it with the apple cider in it.This sounds delicious and it’s a must try for me. Thank you for the recipe. This looks yummy. When I first lived in the UK I made the mistake of ordering Guinness and blackcurrent (which is apparently a legit drink). Disgusting. But Guinness and cider sounds like it would be right up my alley. I love stew and one pot meals. This is going into my recipe file. I love the use of the K_Cups how clever. Yum this looks and sounds so delicious and hearty especially for the cold months. I would love to try this recipe someday! What a perfect soup for cold nights! Thanks for the recipe! looks like a great recipe! Love trying new stews in the winter! This stew looks & sounds scrumptious, thanks very much for sharing this great recipe! Got to make this, nice for a cold snowy day in. Stew is such a comfort foot. BLACK VELVET makes it sound decadent. This recipe looks great. I love stew on a cold winter day.